Paleontology week 2: methods, methods, methods! Home|Paleontology week 2: methods, methods, methods! Week two of the Paleontology module was packed with field methods, a special visitor, and lots of work on student projects. 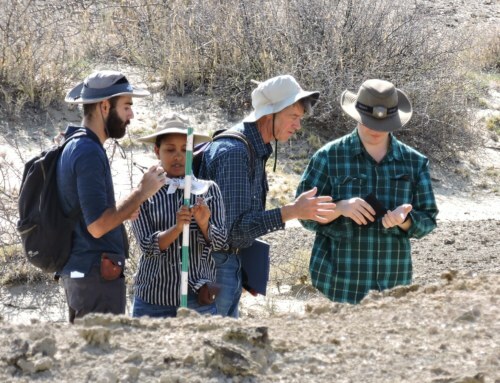 We headed back out to Area 8b to learn more about Paleontological field work. 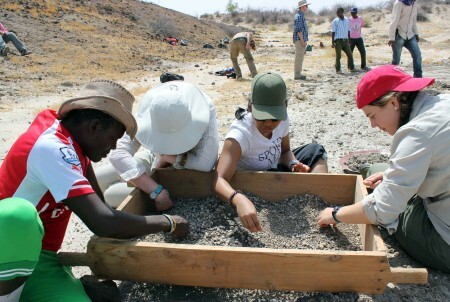 After an hour of prospecting for fossil finds, we began a session on field collection methods. All sciences require some sort of methodological training, and sometimes these skills take a bit of practice. 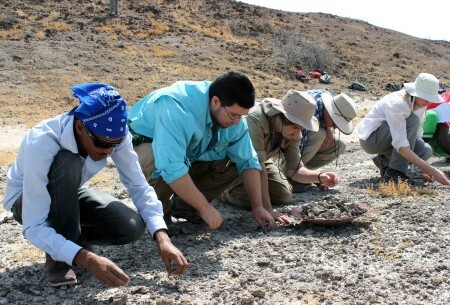 One field method that Paleontologists use while searching for fossils is called the “hill crawl”. The students split into two teams that will slowly crawl over the hill, removing unwanted rocks and debris. 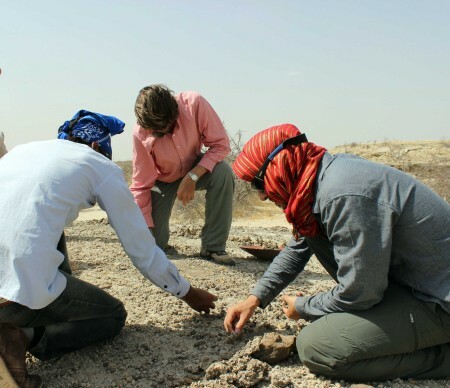 It is what it sounds like – this method involves crawling on the ground, looking closely at the stones and sediments to find even the smallest fragments of fossils. This doesn’t happen randomly. A special section or deposit is selected based on the research question. For us, it was a small portion of an ancient lake bed, located in the middle of a dry modern river bed. The team set out a square area for students to complete the hill crawl. We lined up, seven students on each side of the square and all started slowly crawling over the area, removing all of the stones. 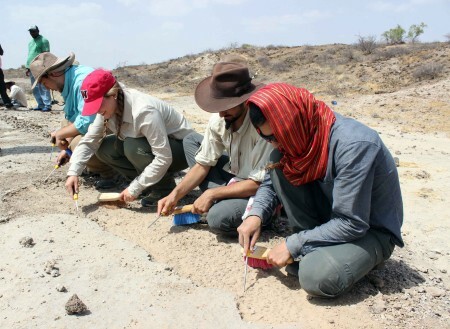 Removing these rocks is an important first step, it helps clear the area so that our eyes can more easily pick up small fossil fragments. It isn’t easy, sometimes what looks like rock is actually fossil, or the other way around. Sometimes bits of fossils are embedded in rocks. It takes a careful and trained eye to spot them. After slowly and methodically removing the stones from the area, we picked up the larger, more obvious fossils and set them aside. Then we swept the area with soft brushes and dust pans. The next step was to carefully go through these finer sediments using a sieving technique. Two people each take an end of the sieve and a third person pours the collected sediments, stones and fossils onto the sieve. The sievers gently rock the sieve back and forth to let the find sediment fall through the bottom. The mesh catches remaining stones and fossils. 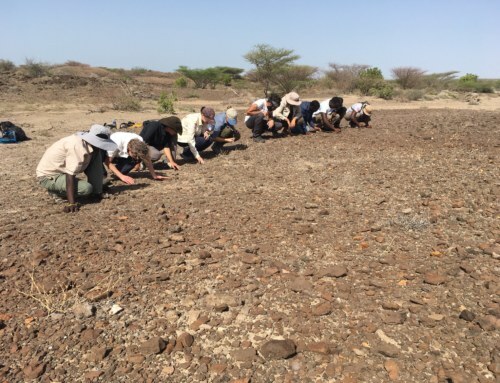 After the sediment has been sifted out, the team members carefully and meticulously search through the debris, pulling out anything that looks like fossil bone. 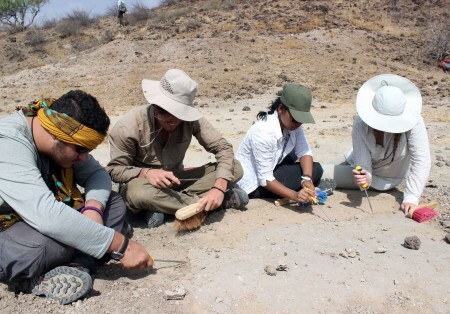 All fossils and fossil fragments are collected for future analyses in the lab back at home. 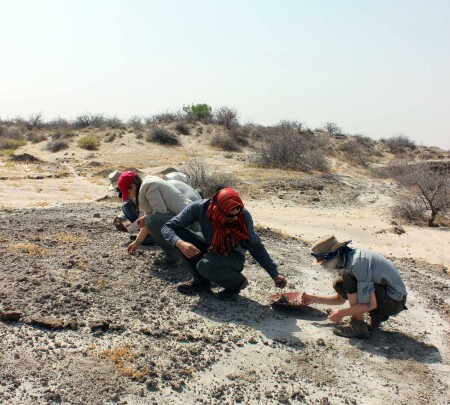 Prof. Fortelius, Niguss and Ryan search the surface for more obvious, larger fossil remains. Max and Ryan gently tilt the sieve back and forth to remove the fine sediment and tiny pebbles. Students pick through what is left over in the sieve to find smaller fragments of fossils that were missed on the first pass. The “hill crawl” method produces fine resolution data about fossil finds on the surface of the soil. But what about the fossils buried underneath the dirt? Our skilled and specially trained TBI research assistants kindly demonstrated excavation techniques for recovering buried fossils. Using fine picks, soft brushes, and dust pans, the excavators carefully pick at the surface to gently loosen the dirt and brush it away. This happens tiny bit by tiny bit, so the excavators don’t accidentally pick through a fossil! Little by little the excavators remove the sediment. 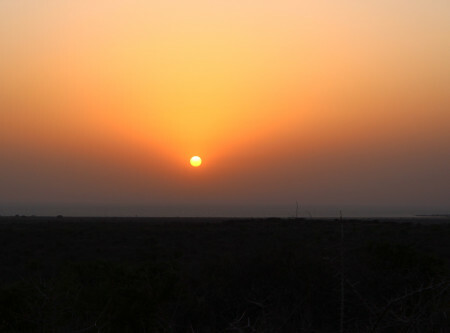 It is important to keep the 3D context in mind as you excavate, always understanding which horizon you are digging in. To do this easily, an excavator creates a small step, carefully removing dirt layer by layer. Dirt doesn’t all look or feel the same – one layer may be lighter in color and very sandy and underneath a new layer is darker and very hard with a lot of clay. These differences are important to note so that you know which layer the fossils are coming from. These field days are long and hot here in Ileret – so sun protection is important! Adriadne assists Max , making sure his head is fully covered in the hot afternoon sun. 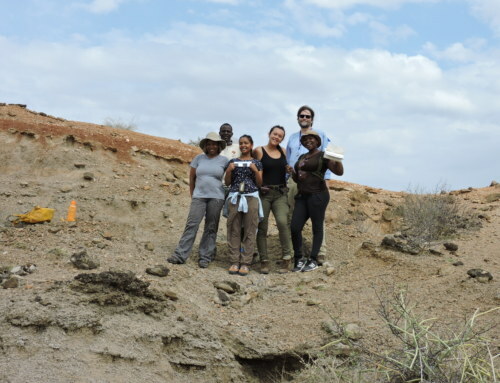 If getting out to Turkana and spending long days in the sun doesn’t sound so appealing, cutting edge fossil finding research is still possible for you. 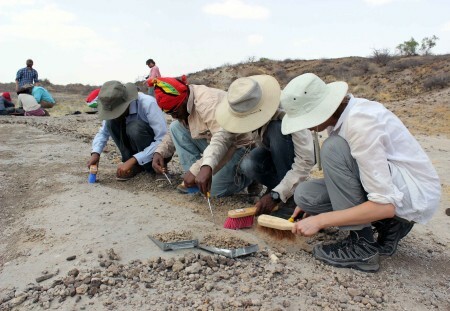 The Fossil Finder project uses very high resolution photography, and the support of citizen scientists, to remotely search for fossils in the Turkana Basin – even while you’re watching T.V. at home. There are countless fragments of fossils, and scientists need to know more about them to reconstruct the past world. One way of accomplishing this never-ending task is to recruit people all around the world to take part. 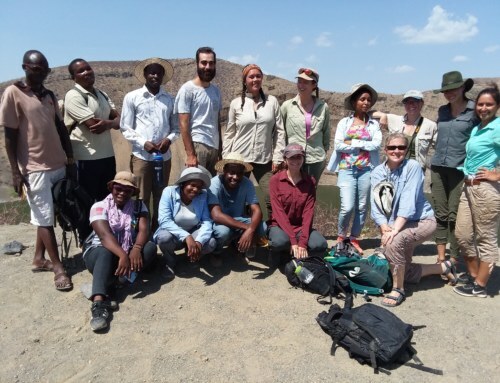 As the project’s motto states: “More eyes, more information, more discoveries.” Luckily, TBI students were able to meet some of the Fossil Finders scientists here at TBI Ileret – visiting areas where fossils have been found by citizen scientists around the world. 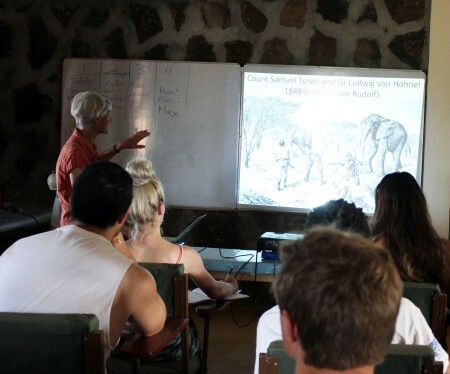 Back on campus, the students were priviledged to hear from Dr. Meave Leakey in a lecture on the history of research in the Turkana Basin. Drs. 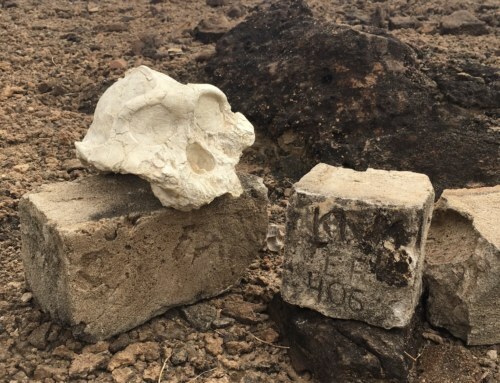 Meave and Richard Leakey are veterans of this research, generating fascinating discoveries about human ancestors and their ancient environments since 1968. It was a special opportunity to hear about the history of this research from a first hand perspective – a truly inspirational talk for the The TBI students and instructors. The second week of this module was packed full with methodological training, including student group projects. All of the projects focused on a particular methodology in Paleontological studies, all related to animal diets and their traces. 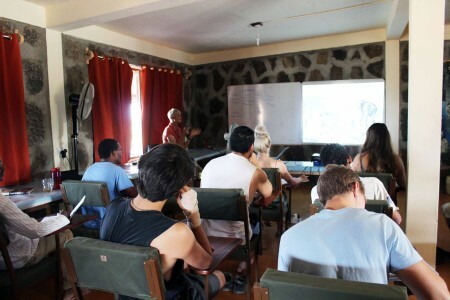 Students generated new data addressing questions related to the amount of minerals animals digest, quantifying the wear on teeth in relationship to different feeding strategies, comparing the morphology of tooth crown shapes between animals with different diets, and even the relationship between how fast an animal chews and body size. All of these projects generated information that can be used to understand how what an animal eats and how they eat it can be heavily related to what their teeth look like. 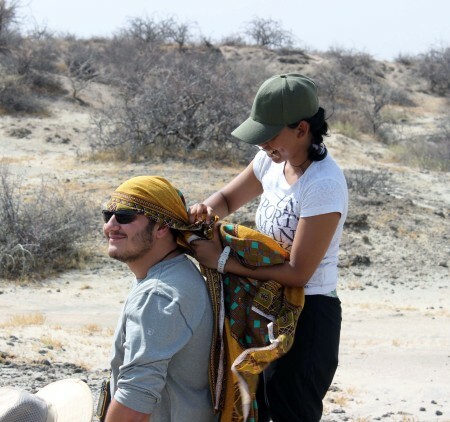 If we can understand how this happens in living animals (such as the local goats and camels around TBI), we are able to approximate similar relationships for animals how have long since been extinct. The students all presented their work and did an excellent job. They enjoyed a day off at the beach and some much needed rest on Sunday to prepare for Geology module week 1! Get ready to hike! 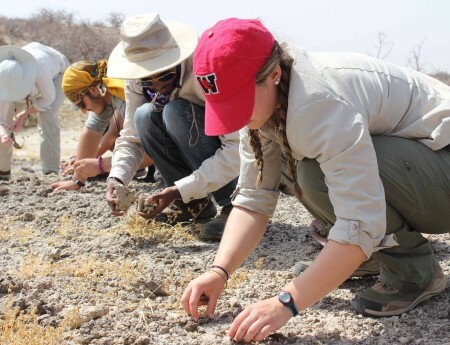 By Hilary Duke|2017-01-04T18:04:36-07:00February 19th, 2016|Field Schools, Spring 2016|Comments Off on Paleontology week 2: methods, methods, methods!